I am interested in how the body initiates an innate immune response to infectious pathogens. In particular, I seek to understand what factors lead to a ‘helpful’ infection-fighting inflammatory response versus damaging disease-causing inflammation. Cytokines are small proteins that play a key role in controlling inflammation, the normal biological response to wounding, or infection. Our research focuses on understanding the signals that occur inside cells exposed to cytokines, instructing them to respond appropriately to infection. We are generating three-dimensional structures of the protein complexes critical in communicating inflammatory signals. This information is underpinning the development of agents that can control the immune response. Our ultimate aim is to advance novel treatments for the severe inflammatory conditions. I am interested in how the body initiates an innate immune response to infectious pathogens and then maintains ‘helpful’, rather than ‘damaging’ inflammatory responses. The SOCS proteins are classic negative regulators that act as a handbrake to limit the damage associated with excessive pro-inflammatory cytokine signalling. TRIM proteins are another important class of intracellular proteins which both positively and negatively regulate innate immune signalling. 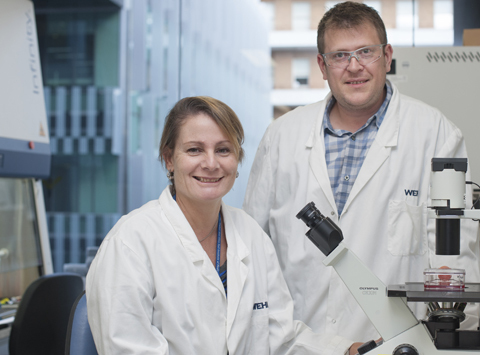 Our research program aims to understand the molecular detail of SOCS and TRIM protein complexes and how these signalling complexes are regulated in inflammatory and infectious disease. We are taking an integrated multi-disciplinary approach, which utilises in vivo model systems, quantitative proteomics and structural biology. Ultimately, I am interested in the connection between the deregulation of intracellular signalling and disease. Within this context, my research is focused on understanding how these protein families regulate innate immunity. Our bodies are constantly fighting off the development of cells that lead to tumours. Researchers have now discovered a protein ‘brake’ within Natural Killer cells that controls their ability to destroy their target tumour cells. A protein called SOCS4 has been shown to act as a handbrake on the immune system’s runaway reaction to flu infection, providing a possible means of minimising the impact of flu pandemics.